1.) In my former life, I was a badass backup singer for 80's rock bands. AKA: The lost years. 2.) I went to culinary school. My first day of butchering class, I passed out. They swiftly moved me to the pastry program. 3.) I have a rescue dog named Honeypie. Every morning I wake up with bones buried beneath my body. Creepy or cute? 4.) I'm a perfume junkie. I only wear it at night. I put it on before I go to sleep, so I can dream in the fragrance. 5.) When I laugh really hard, it always turns into sobbing. 6.) I like cheese in a can with Triscuits. Judge me. 7.) I enjoy sewing. I don't like to use patterns, so I mainly stick to pajamas. They look awesome in the dark! 8.) At 16, I became an emancipated minor. 9.) I adore bad horror and sci-fi films. The cheesier the effects, the better. 10.) I once broke my arm sliding down a waterslide onto a frozen lake wearing ice skates. And falling off a chair. And riding my tricycle down the spiral stairs. I was that kid. 11.) I have Misophonia, which literally means, "hatred of sound". I have very strong reactions to slurping and loud chewing noises. I'm also sensitive to repetitive movements. 12.) I can't sleep without socks on. Big fuzzy ones, preferred. 13.) I'm scared of just about everything, except dying. I'm strangely at peace with that whole thing. I've lived an amazing life. 14.) At least once a week I think about chucking it all and living off the grid. 15.) I once landed an audition for Saturday Night Live. Unfortunately, they laughed at me, not with me. 16.) I love to bowl. Yes, I own a custom ball. 17.) I have two Swedish stepsons. 18.) I grew up in a house with a secret door to a cave. 19.) I'm superstitious. I can't drive through a yellow light without scratching the roof of the car. 20.) In my reckless youth, when I wanted to break up with someone, I moved. I ended up moving a lot. 21.) My sister is an aerospace engineer for the D.O.D. 22.) I once got a citation for skinny-dipping in a public fountain. I don't mess around with Truth or Dare. 23.) I was born in Romeo, MI. 24.) My grandmother was married seven times. She had a diamond encrusted cigarette holder and talked like Zsa Zsa Gabor. I adored her. 25.) I'm an Aries. A Hufflepuff. A Larkin. An Erudite. 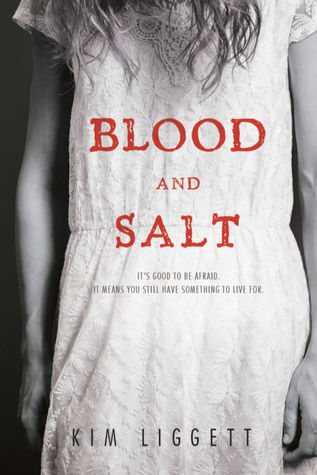 Winner will receive a hardcover copy of Blood and Salt by Kim Liggett. This is a tour-wide giveaway sponsored by Penguin Teen.